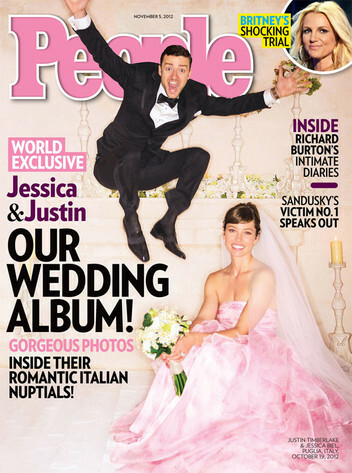 As soon as pictures of Justin Timberlake and Jessica Biel’s October wedding were released, everyone immediately noticed Biel’s unique gown. Instead of a traditional white wedding dress, Biel opted for a pink Giambattista Valli gown. Some were left scratching their heads as to why she chose a colored gown, but now it’s no longer a mystery. Biel opened up about her wedding day and dress choice in the January 2013 issue of Elle. Even though she was hesitant about the color at first, she still never imagined herself saying “I do” in something traditional. She’s “never been crazy about all-white wedding dresses,” at least for her own walk down the aisle. All she knew is that she wanted something romantic and feminine and in a shape that she rarely wears. We say she, with some help from a talented couturier, nailed it on the head! Biel may have shocked with her pink gown, but she’s not the first celebrity to choose a colored dress for their wedding day. Here are 9 other stars that also ignored the traditional assertion that you must wear white to your own wedding! Anne Hathway married Adam Schulman this year in a pink Valentino gown. 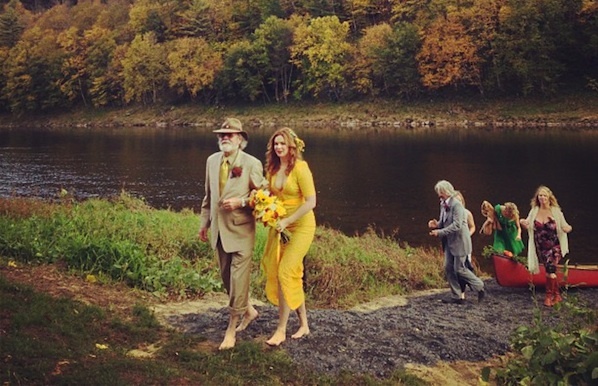 Amber Tamblyn wed David Cross this year in a yellow dress. For her 2012 wedding to Christine Marinoni, Cynthia Nixon opted for a green Carolina Herrera gown. Reese Witherspoon wed Jim Toth last year in a blush pink gown. Sofia Coppola wore a purple Azzedine Alaia dress when she wed Thomas Mars in 2011. Julianne Moore married Bart Freundlich in 2003 wearing a lilac-hued Prada dress. Gwen Stefani wed Gavin Rossdale in 2002 in an ombre gown. Sarah Jessica Parker wore a black dress when she married Matthew Broderick in 1997. Jenna Dewan-Tatum wore a blush pink gown for her wedding to Channing Tatum in 2009.